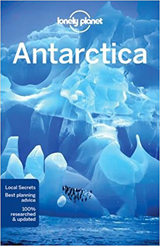 Trip Highlights: Explore the majestic beauty and amazing wildlife of the Antarctic Peninsula. The pristine scenery of Antarctica is unlike any in the world. The white continent offers unparalleled landscapes and an abundance of wildlife including penguins, seals and whales. This voyage also features classic sites of historic and scientific interest. Experience the journey of a lifetime to this fascinating region of the world. Single Rate: 1.7 to 2 times the twin, double occupancy rate. Rate Includes: One night pre-voyage hotel in Ushuaia; group transfer from the airport to the hotel on the day prior to departure; group transfer to the ship on embarkation day; group transfer to airport or central location upon disembarkation; photography program; welcome and farewell cocktails; digital voyage log; complimentary wind- and water-resistant parka; all meals onboard the ship. Inclusions subject to change without notice. A frosted wilderness of glistening white as far as the eye can see. Natural ice sculptures like enormous works of avant-garde art. This is the modern explorer's final frontier. Hear the cries of penguins multiplied by the thousands, watch leopard seals and sea lions perfectly at ease in the company of visitors, feel the unspeakable magnificence of a whale breaching from beneath cold ocean waters. Astounding animal encounters -opportunities found nowhere else on earth. Arrive at the ship in the afternoon and be greeted by the Expedition Team and ship's officers at a safety and orientation briefing followed by the Captain's welcome dinner. After dinner, relax and take in the mountainous scenery on an early evening sail down the Beagle Channel past penguins, cormorants, and sea lion colonies. The Drake Passage has a notorious reputation for its turbulent seas due to the Antarctic Convergence, a natural boundary where cold polar water flowing northward and warmer equatorial water moving southward mix. When they meet, nutrients are pushed to the surface, often attracting a multitude of seabirds and whales. Spend some time on deck watching the horizon and the variety of seabirds that float in the air currents of the ship's wake such as the black-browed albatross, sooty shearwaters and white-chinned petrels. The White Continent stretches before you, a land of extremes and extreme beauty. Your expedition leader and captain will create a flexible itinerary based on weather, ice, and opportunities for wildlife viewing. The route will focus on the most scenic bays and channels of the Peninsula with stops at penguin rookeries, seal wallows, bird colonies and whale feeding areas, as well as sites of historic and scientific interest. 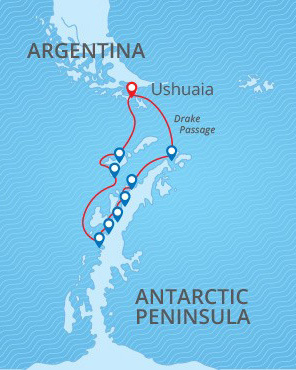 The trip may include picturesque Neko Harbor, sheltered Paradise Harbor, the humpback whale frequented Wilhelmina Bay, the striking Lemaire Channel, the wildlife-filled Penola Channel, or the majestic Neumayer Channel. You may stop at an active scientific base such as Poland's Arctowksi or Ukraine's Vernadskiy, as well as an historic base such as U.K.'s Port Lockroy or Wordie House. 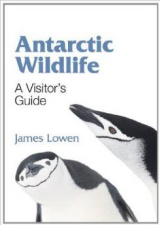 Adelie, Chinstrap and Gentoo Penguins abound, and Weddell, crabeater and elephant seals haul out of the sea to rest along with predatory leopard seals and the aggressive Antarctic fur seal. Minke, humpback and orca whales are frequent visitors of this region and provide many opportunities for whale sightings. The Drake Passage has a notorious reputation for its turbulent seas due to the Antarctic Convergence, a natural boundary where cold polar water flowing northward and warmer equatorial water moving southward mix. When they meet, nutrients are pushed to the surface, often attracting a multitude of seabirds and whales. Spend some time on deck watching the horizon and the variety of seabirds that float in the air currents of the ship's wake such as the Black-browed albatross, Sooty shearwaters and White-chinned petrels. As you return to Ushuaia, take advantage of the opportunity to listen to additional presentations offered by onboard specialists and swap prized photos with new found friends. This morning, disembark in Ushuaia, the world's southernmost town, to catch flights homeward or continue on with your adventure. Read this itinerary as a guide only; the exact route and program varies according to ice and weather conditions -and the wildlife you encounter. Flexibility is the key to the success of this expedition. All guests are required to have comprehensive travel insurance coverage including medical, evacuation, cancellation and trip interruption. Proof of coverage is required prior to embarkation. We strongly recommend at least $200,000 Emergency Medical/Evacuation coverage which includes coverage for cancellation, trip disruption, baggage and personal property. We can assist U.S. residents with travel protection options. Other conditions may apply based on pre-existing conditions. Group transfers from airport to Ushuaia hotel on the day prior to departure; 1 pre-voyage hotel night in Ushuaia (if a single traveler reserves a shared cabin aboard the ship, they will automatically receive shared hotel accommodations on the pre-cruise night at the hotel); group transfer to the ship on day of embarkation; group transfer to airport or central location upon disembarkation in Ushuaia; shipboard accommodations; scheduled landings/excursions; meals on board ship; coffee/tea station 24 hours on ship; welcome and farewell cocktail on ship; a pair of rubber boots on loan for shore landings; expedition jacket (yours to keep); port fees; digital Voyage Log. Subject to change without notice.